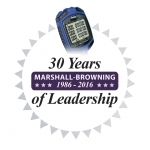 If you've been looking for a fairly priced, easy to use display timer look no further. 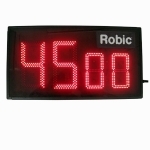 The Robic M903 Bright Display Timer measures 17 inches wide by 9 inches tall by 2" thick and features 6" LED digits for viewing up to 100 feet away. This versatile clock will hang on a wall or sit on a table top. 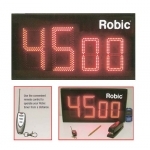 The ultra bright display can be seen as far as 100 feet away. That will give you full gym coverage. This clock comes with a loud competition style alarm built right in too so there's no extra accessories needed. Wireless remote included.